Marshy Point Nursery - Site Launch! 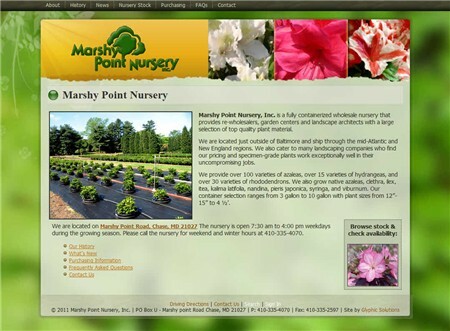 We are pleased to announce the launch of a new web site for Marshy Point Nursery! Marshy Point Nursery is a fully containerized wholesale nursery that provides re-wholesalers, garden centers and landscape architects with a large selection of top quality plant material. We built this site on a fully-customizable content management framework with a secure login for easy administration. The site also features a searchable custom-built plant inventory database with customer login feature to view custom pricing reports. Administrators can login and quickly update plant stock inventory and upload new photos in real-time. New Sites Coming this Spring! I am working hard to deliver 3 new web sites for a new client this year. 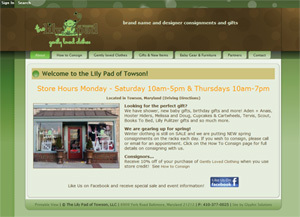 One site is for a consignment shop in Towson and the other two are for a local nursery and wedding events business. Stayed tuned for 3 new fresh sites coming soon! Please contact me here if you are interested in getting a fresh new look to your site or if you have a great idea for a new site. Glyphic Solutions would like to announce and welcome 2 new clients during the first half of 2010! We recently launched a new web site Imagine Speech, an innovative company that develops and sells interactive children's software developed by a speech-language pathologist. The site features a fully-interactive content management system, online e-commerce store-front, commerce reports and graphs, Paypal integration, administrative center with secure login, contact form, news blogs, and more. We also built a custom security/copy protection system for Imagine Speech games that is integrated directly with customer registration and online purchases. We will be launching a new site this month for Bagwell Accounting Services - a Maryland based LLC company specializing in Bookkeeping, Tax, & Business services. Now Supporting Customizable Artiseer Web Templates for your site! 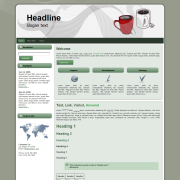 We just added support for web templates generated by Artisteer. The Artisteer community currently offers over 600+ free website templates you can choose from to help get your site off the ground much faster! 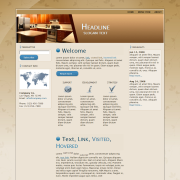 Or we can help you to design your very own custom design using the same tools used by the attractive templates. 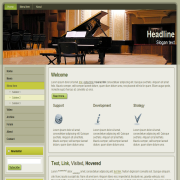 The content management system that we use (mojoPortal) recently added additional support for these web design templates so they can be integrated with your very own CMS solution that we build and host for you! Let us know if you see a design you like and we can customize it for you or just build something totally unique to fit your business logo, colors, and aesthetics! Please contact us to discuss details of how we can help you get your site off the ground today! Need a new web site, today? Glyphic Solutions is proud to announce adoption and hosting of a powerful content management system framework (CMS) called MojoPortal. This web solution is built on .Net technologies and allows for rapid development and deployment of data-driven web sites. The MojoPortal framework allows you (the customer) to login and have full control over the content, layout, and organization of your web site. No knowledge of HTML is required. Create accessible standards compliant web pages and content right in the browser. So whether you need a slick new website to show off your personal achievements or a powerful business website to advertise and sell your products & services online, Glyphic Solutions can help you hit the ground running fast! Rapid development, affordable hosting, full control over your site, easy to use interface and content editors. We are a full-service shop and will provide you with initial setup, hosting, graphics, design, maintenance, upgrades, consultation, custom custom programming and more. For more information or inquiries, please visit our Contact page and send us a message today!